This year’s Maundy Thursday commemoration at Holy Cross included: hand washing, soup supper, eucharist, intimacy and this story from the Reverend Susan J. Thompson who, along with Pastor Tom Doherty presided over our worship. It was a dark and . . . windy night. The swinging doors into the sanctuary were banging, the tree branches scraping against the stained glass windows, and casting eerie shadows. It was then my colleague and I decided to make the place a little cosier for our Maunday Thursday service. We scrambled around the balcony storage and found all our Christmas tea lights and holders, and both of us had plenty of candles in our studies. We placed all of them around the chancel, and on the window sills where the shape-dancing trees seemed a little less intimidating in the warm candle glow. In a kitchen to the right , Session members were preparing warm scented water and gathering the tubs in which to immerse people’s feet. The towels were at the ready. All we needed now was the chalice and plate for the elements, so I raced downstairs to the cupboard. I was stopped in my tracks by a pounding on the door. My heart sank as I went to it, for there was (let’s call her Louise) a client of our food bank. I opened the door, exchanged pleasantries, and politely informed her that the food bank would be open next Tuesday. “Oh, I don’t want food, she said”. Just a pair of shoes”. “Well, can you get them then?”, I said. “We’re just about to start a service and I’m in a bit of a hurry”. A scowl crossed her face, and I looked down to see she was not wearing shoes, but an old pair of boots about to disintegrate. I was panicking inside a little…time was short and this wasn’t my area of responsibility. The shoes were on racks locked in a storage cupboard. I’d have to find the key and pull it out. Louise kept going on about not wanting runners but a nice pair of shoes…the kind she could wear somewhere nice. I couldn’t imagine she had anywhere nice to go, but I nodded and went for the key. When I got back, she helped me pull out the rack. “Do you know your size….I don’t have any idea how they organize this”. “Oh I do, honey, don’t you worry. If they are here, they’ll be on this side”. She looked a bit, and then squealed “yes, by God these are the ones!!! 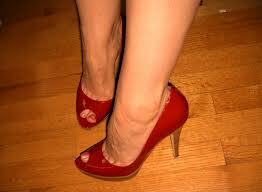 She was pulling out a pair of scuffed up reddish pumps. “Great, I said…I’ll put away the rack”. She stared at me like the idiot I was being. “I have to try them on first”, she said. And suddenly I realized what I was doing. I felt inwardly ashamed about rushing her, so decided to try and help. Now people who know me know how clumsy I am in doing physical things. Helping people try on shoes was not my speciality. But I found her a chair and got her to sit down. “Here, take your boots off, and I’ll help get your toes in so you can slip into them”. Easier said than done! I finally had to get on my knees in front of her. Her feet were bare, dirty, and more than a little smelly. I was sure the shoes would not fit. The ugly looking bunion was the culprit. Down on the floor, I suddenly had a flash of what was about to take place upstairs…my congregation intimately washing one another’s feet. And as I was shoving on the shoe, needing to hold her dirty foot, I felt in my hands the foot of Christ. I looked up, and there was Louise’s face … the face of Christ beaming down at me. “We did it, she exclaimed with a delightful laugh!” “They’ll do just fine. A little tight, but I’ll work them in”. I ruefully thought to myself that they were already more than a little worked in. She got up, and awkwardly twirled around in a circle. “Yup, just what I wanted. Thanks sweetheart”. As a gesture of contrition, I asked if she needed any bags of food since we were already down there. “No”, I said…”but maybe I’ll see you next Tuesday”. “o.k. sweetheart”. And with that she was swept away into the windy night. I scurried back upstairs with the chalice and plate, thinking that our encounter would be the surprise event of the night. But that was not all that happened that amazing Maunday Thursday. Almost everyone was there when I got back. This was always a small intimate service. I could name everyone who came. We were just ready to start when the back door opened and a young woman walked in…a stranger to me, and by the looks of our people, to them as well. She took her place with us and we began. When we came to the foot washing, she watched quietly as people in a leisurely way sat on the steps of the chancel, taking off their shoes and socks, waiting for someone to wash their feet, and then taking a turn washing the next person’s. She did not seem shy, and took her turn near the end both to receive and give a foot wash. It was a most moving night as we huddled together away from the wind into the warmth of the candles, and I know I was not the only one to see Christ light reflected in people’s eyes as we felt the intimate love of community in a holy sensuous time… smelling scents in the air, warm water on our feet, the touch of kind hands carefully and slowly drying our feet … a precious, simple intimacy with friends…and one stranger. Christ present . . . in, with and through us. The next week, that young woman came to see me. She was a musician, a vocalist who had studied massage and Reike to earn her living while she took lessons and looked for gigs. She had been living in New York, but felt compelled to come back to Toronto. A highly intuitive person, she discerned that she wanted to be part of a spiritual community. Not long after she made that decision, she had a dream about a church with candles flickering wildly in church windows. That was last Wednesday. And on Thursday, she was walking home from the subway and saw the candlelight in our windows and walked in. And so began a wonderful relationship. She joined our choir and the next year sang at our Maunday Thursday service. “Those are for good, NOT here”, she said disdainfully. And I realized, I had much more to learn. And maybe down here in the food bank was a good place to begin. I feel so privileged to be part of this Holy Cross community. We experience intimacy here in many ways. And I think that is an important part of preparing to be love in the world. This entry was posted in Evolutionary Christianity, Progressive Theology, SERMONS, STORIES and tagged emergent theology, evolutionary christianity, Maundy Thursday sermon, Maundy Thursday story, Progressive Christian Maundy Thursday, progressive christian spirituality, progressive christianity, progressive theology, Rev Susan J Thompson, spirituality by Rev. Dawn Hutchings. Bookmark the permalink.